I planned a vacation day Monday to recover from our trip and get in one last restaurant week meal. I had made reservations for Convivo weeks before, but upon waking up Monday morning I just didn’t feel like going. The thought of a fancy, formal restaurant just didn’t appeal to my state of mind. I wanted something fun and casual where I could just relax. So I looked online and swapped my Convivo reservation for Bobby Flay's Mesa Grill. I’d been to Mesa Grill once before for brunch and while I enjoyed it, it certainly didn’t blow me away. However their RW lunch menu online really good so I decided to give it a shot. The main dining room was almost completely full when I entered around 12:30 and the bar filled up within minutes of my being seated. Maybe since the restaurant got full so quickly the poor bartender was slammed. It took a good 10 minutes to get a menu and another 10 minutes to finally place my food order. 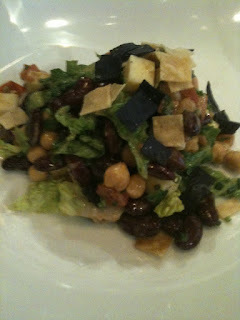 Luckily my appetizer came out within seconds of ordering- Sophie’s Chopped Salad. As you all know I love salad but I probably should have asked for a description of this dish before ordering. I had one idea of a chopped salad in my head and this was very different. There was hardly any lettuce at all. It was filled with little square cubes of cheese, tortilla chips, three kinds of beans and a ton of tomatoes. I don’t really care for beans too much and the cheese was a little overpowering. I ended up picking out the little bits of lettuce and leaving behind the rest. Unsatisfied with my salad, I ended up eating two pieces of bread from the basket, a French roll and a bluecorn- jalapeño muffin. 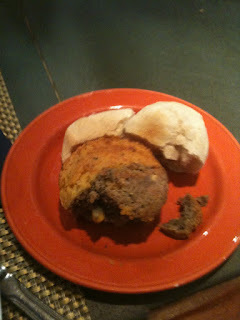 The French roll was great- toasty and warm inside perfect for a big slab of butter. The muffin on the other hand was kind of a toss up. At first I hated it. The jalapeño section was just too spicy for me on its own. However taking a bite from each side at once proved to be wonderful. I really enjoyed the sweet and spicy together and I ended up eating the whole thing. 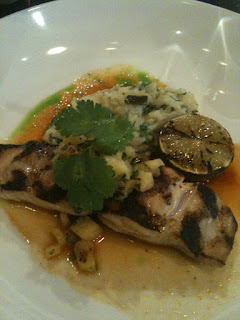 For my main I ordered the Grilled Mahi Mahi with Roasted Pinapple- Cascabel Chile Sauce, Caramelized Pineapple-Green Onion Salsa and Creamy Green Chili Rice. This kind of went the same way as the muffin. At first the outside of the fish tasted too charred and overpowering. However the more I ate, and the more chili sauce I added to the dish the better it got. The rice it came with was so creamy and delicious it was the perfect addition to the strong char. It ended up being quite a solid little entrée. 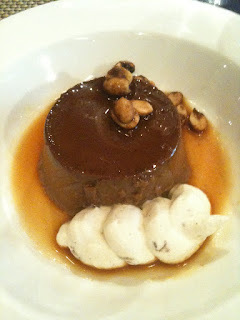 For my dessert I got the Chocolate Peanut Butter Flan with Kaluha Whipped Cream. Wow- this dessert was rich. I mean seriously rich. Thank goodness for the addition of the salty peanuts and Kaluha Cream. The flan alone would have been way to dense in chocolate for my blood. As it was I couldn’t finish the dessert, but it was a pleasant end to the meal. Now my gripes- the wait! I had to wait another 25 minutes after my entrée was cleared for dessert! In fact, the poor slammed bartender ended up going all the way to the back and getting it herself finally, instead of the usual waiters who had been serving me all meal. There did not seem to be good communication between the kitchen and the front. I didn’t end up leaving my lunch until 2:15 which is almost two hours long. That’s a lot of time for a solo lunch. It’s the same problem I had at Aureole. Maybe it’s a restaurant week thing? However everyone working was so friendly and gracious it was hard to get too upset. They score points for being apologetic which is nice. Overall it was a solid meal- definitely not the best restaurant week meal I’ve ever had but far from the worst. If I was ever craving a Tex-mex style meal again I would return. Just maybe not when they’re so busy.